In the original town of Memphis (Shoals) the Catholic Church began to serve the people of this area in June 1853 when Clement J. Horsey deeded 10 lots to Bishop St. Palais, of the Diocese of Indianapolis, "as a site for Catholic Church and for the benefit of the Catholics of this vicinity." Mr. Horsey was a non-Catholic and probably had no motive in making the donation other than the hope of financial profit, which he expected to reap from the advanced price at which he would be able to sell the surrounding land, most of which he then owned, if a church were only built there. Several persons who resided in Memphis at the time stated that several of these lots were purchased from him and that he donated the others. Father Patrick J. Murphy from St. Marys, Barr Township, visited the place about this time, and he collected the money with which to pay for the purchased lots. His chief contributors were persons employed on the O & M Railroad, which was being built then. It was these same people who constituted the first congregation organized in later years. Part of the lots were sold by Father Quinlan for the purpose of buying ground for a graveyard, which is just northeast of the town adjoining the town cemetery. Records indicate that the three-acre cemetery was established on May 20, 1867. The neat brick 60 by 30 feet church with stone foundation was erected in 1869 under the guidance of Father Louis Gueguen, when it was a mission from Loogootee until the year 1871. Father Gueguen named the church in honor of his own patron, St. Louis, according to the HISTORY OF CATHOLICITY. When first built, it was to be used as a school afterwards when the congregation should become strong enough to build a new church. Thomas Hart (whose sons were substantial aiders of the church), a Mr. Kimmeling (who resided there only temporarily), and Martin Mohr (who was a stone mason who did much to start and build the church) were trustees during the construction of the church. Germely was treasurer for a time at this early period and was one of the early workers. In fact, all the Catholics then residing there were willing helpers. It was then a mission from Salem until 1873 when transferred to St. Marys. 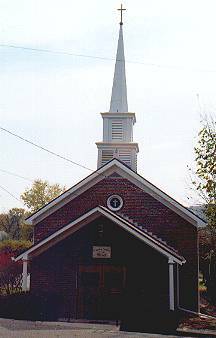 In 1875 it was joined to St. Simons, Washington, where it remained until 1877 when the Reverend Michael Quinlan was assigned the first resident pastor. The Shoals Church then served two other churches, Salem and Mitchell, as missions. The Salem Church was closed and the property sold in 1887, leaving Mitchell as the only mission. The two-story frame rectory built in 1878 at a cost of only $500 stood on two lots west and facing the church. An entry shows that $95 of this amount was realized from a steamboat excursion the river, less $5 paid to Mr. Hayes for advertising in Washington papers. The rectory was destroyed by fire in 1895, and the residence of the priest was moved to Mitchell in 1907 after the mission was opened at Willow Valley in 1906. The following priests have served the Shoals parish: As a mission, 1853-77, the Rev. Patrick J. Murphy from St. Marys, Barr Township; the Rev. Philip Doyle, the Rev. John Mougin and the Rev. Louis Gueguen from Loogootee; and the Rev. B.H. Kintrup from Mitchell. In 1877 the Rev. Michael Quinlan became the first resident pastor serving until 1882. He added the frame sacristy to the church. He was followed by the Rev. P.R. Fitzpatrick,1882-1887. Father Fitzpatrick put in the neat little Romanesque style altar. Father W.H. Slaven of St. Martins served for one year 1887-1888. On September 18, 1888, the Rev. P.J. Byrne took charge attending also to Salem and Mitchell and during the watering seasons in French Lick. It may be said that his coming marked a new era in the history of Catholicity there. He went to work at once in an interested and zealous manner as if he thought only of bettering his people and building up his parish regardless of whether his stay would be long or short. The good people in the parish never before had the opportunity or encouragement as now, and they were not slow in availing themselves of the one and showing their appreciation of the other. The cemetery had been put in order, the church painted exteriorly and neatly papered inside. A marble plate with the name of the church upon it had been placed over the door and a neat cross had been placed upon the belfry. A choir had been organized and was making good progress, and the residence had been repaired and furnished. Around the church lot in various places a number of young trees had been set out by Mr. Richard Honey who made his headquarters there, and soon the trees added greatly to the beauty of the property and to the comfort of those who frequently used it, particularly in the heated season. Mr. Honey, who was not enumerated as a regular parishioner, had often helped in various ways and deserved to be remembered. During Father Byrnes years, Forty Hours Devotion was held with 85 communicants. Rev. Fathers Piers, Doyle, McCabe, Donaghue, and Slaven were present and assisted the pastor. Mrs. Driscoll and Alice Crane from Washington were present and aided the choir. Phil McGovern, who was Martin County Auditor, was formerly at St. Martins. He, Charles Mohr, and James McHany were members of the Branch 63 Catholic Knights of America at Loogootee, but they expected to have a branch of their own in the future. J.M. Swords and family of three sons and three daughters were of great aid to the church during their residence of eight years there. The sons and daughters directed and largely consisted of the choir while they lived there. William Wilds had always been one of the most liberal parishioners. He had been in the liquor business for a number of years but had been desiring to quit. Over his bar was painted in large letters the legend "DRINK MODERATELY." His friends would recommend him as Archbishop Irelands "Model liquor dealer." Father Byrne serving 1888-1894 was followed by Rev. L. Fichter, 1894-1897; the Rev. Francis W. Wolf, 1897-1900; the Rev. W.J. Cronin, 1900 ( 9 months); the Rev. Theodore J. Mattingly, 1900-1903; and the Rev. August Sprigler, 1903-1907. From 1907-1915, Shoals was attended by priests from Mitchell; and from 1915-1931, it was attended by the Reverend Assistants of Bedford. Shoals was again served as a mission from Mitchell from 1931-1944 when the new Diocese was established at Evansville, and Shoals was then attached to St. Martins. This arrangement continued until September 1950 when Father Edwin Spalding was assigned as resident pastor. The Reverend Fathers Timothy E. Kavanaugh, James L. Bolin, D.J. Manning, Omer H. Eisenman, Paul A. Deery, P.A. Brisse, John J. Vincius, Jerome Bennett, August. B. Fichter, Arthur P. Mooney, and Anthony E. Roach served the parish as a mission from 1907-1950. Succeeding Father Spalding as resident pastors were Father Richard L. Hoffman 1858-1963, James P. Hannigan 1963-1969, Albertus P. Lutterbach 1969-1975, and Kenneth R. Betz 1975-1982. On September 2, 1982, St. Marys once again was without a resident pastor being served by Father Paul Stone, of St. Martins, Whitfield. On June 4, 1983, Msgr. Carl A. Shetler was named pastor of St. Martins, Whitfield, and administrator of St. Marys. The rectory-residence, built 1896-1897, was razed in 1988, and construction of the parish hall was started the first week of May 1988 and was completed on November 1, 1988. An Open House/Dedication was held on January 8, 1989. On July 10, 1996, Msgr. Shetler was succeeded by Father Gregory Spencer, of St. Josephs, Bramble. Father Spencer departed St. Marys in June 1997. St. Marys was then served by visiting priests until June 28, 1997, when Bishop Gerald A. Gettelfinger appointed Father Leo C. Kiesel as temporary administrator. Then on November 24, 1997, Bishop Gettelfinger appointed Father Kiesel as pastor of St. Marys and to continue as pastor of St. John in Loogootee, where Father Kiesel resides. During the summer and fall of 1999, the pews were removed and refinished, the kneeling pads were replaced, some new lights were installed, and the church interior was repaired, painted, and carpeted. The exterior was restored to the original brick, new windows were installed in the sacristy, and new doors were installed in the basement and the sacristy. The Most Reverend Bishop Gerald A. Gettelfinger celebrated the 10:00 AM Mass on Sunday, October 24, 1999. An Open House carry-in dinner celebrating the 130th anniversary of the building of St. Marys church followed at 11:00 a.m. in the Parish Hall.